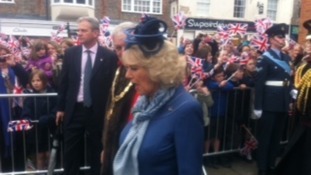 The Duchess of Cornwall is in Thame in Oxfordshire as hundreds of members of the armed forces take part in the town's first freedom parade. Soldiers and staff from RAF Halton marched in front of cheering crowds. Penny Silvester was there. The Duchess of Cornwall is in Thame in Oxfordshire as hundreds of members of the armed forces take part in the town's first freedom parade. The Duchess of Cornwall is in Thame in Oxfordshire as hundreds of members of the armed forces take part in the town's first freedom parade. Soldiers and staff from RAF Halton will march down the high street in front of cheering crowds.